Discussion in 'SEO - Other' started by LinkBuildingServices, May 3, 2018. Hello! Do you mean sample of backlink? If yes, please tell us your niche. Links are also available in our inventory. Have You Ever Tried Automatic Tools For Managing Your SEO Campaign(s)? So How You Can Benefit from SEO Expert Tool? 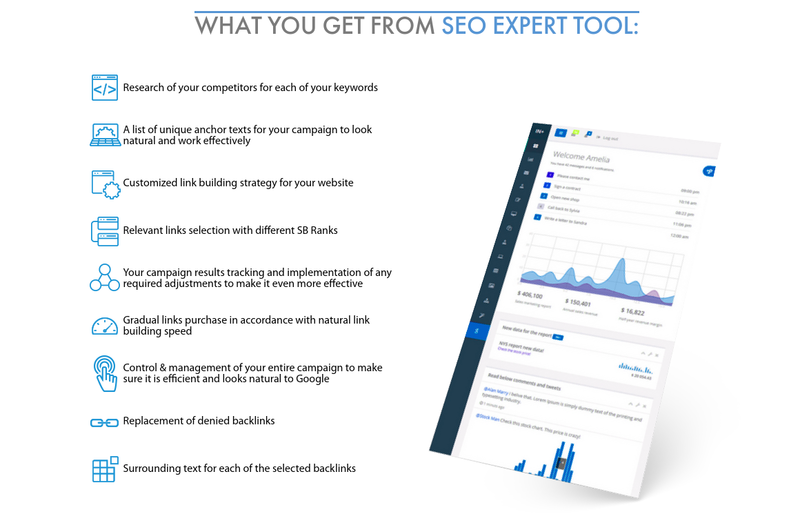 The tool will give you insights into efficient SEO campaign management that you’ll be able to use for your projects. It will generate unique anchor texts for your campaign to look natural, replace denied backlinks, manage your SEO campaigns for all URLs at one place. How SEO Expert Tool Can Help You? The tool will give you insights into efficient SEO campaign management that you’ll be able to use for your projects. It will generate unique anchor texts for your campaign to look natural, replace denied backlinks, manage your SEO campaigns for all URLs at one place. Get access to our premium backlink inventory (8,000,000 web pages from US, UK, CA, EU, different DA, PA, hundreds of niches). More experienced users will avail of custom filters such as link types, anchor types, main page or subpages, link building speed, keywords etc. your work connected with management of all your clients SEO campaigns? Is automatically managed SEO a myth? What does SEO Expert Tool do? Do you want to apply such a tool for your campaign? How You Can Benefit from SEO Expert Tool? Thanks! We would appreciate if you left your detailed feedback about the tool. What Is the Key Advantage of SEO Expert Tool?